In 2001, the last year before Metro began spending money on light rail, Houstonians took over 89 million trips on Metro’s local bus service. [i] Last year, the combined trips on the local bus service and the light rail system came in at about 76 million, a decline of over 14% since 2001. [ii] Over that period Harris County’s population has grown by over 30%. Considering that after Metro invested $2.2 billion in light rail, yet fewer Houstonians are opting to take transit, it seems a good time to ask: Was it worth it? This means the light rail has done virtually nothing to reduce congestion. Getting some buses off the street probably improves congestion to some minimal degree, but then I have never been in a traffic jam on Harrisburg anyway. And the light rail causes its own congestion, like the fact that we can no longer synchronize the lights downtown. Although Metro’s leadership appears to have mostly abandoned the idea of building more light rail, it still seeks to justify the investment on a variety of other grounds. It argues, for example, that the light rail has spurred development in the areas it serves. And there is some evidence that supports that contention. The East End is certainly experiencing a revival that more or less coincides with the light rail being extended into that neighborhood. To what degree that new development was caused by the light rail or independent of it is difficult to ascertain. In my opinion, Metro undermines its credibility by frequently citing the total new development along the light rail lines. I think the last number I heard was $8 billion. But that includes all the new development in the Texas Medical Center, which had absolutely nothing to do with the light rail. But whether there have been any collateral advantages from the construction of the light rail system is not the question we should be asking ourselves. The question should be: Why did Houstonians support building in the first place? I don’t have any polling from the time of the referendum, but polling on transit over a long period of time has shown that most people support transit because they hope someone else will take it and relieve the congestion they experience. (See If So Many People Support Mass Transit, Why Do So Few Ride?, Eric Jaffe, City Lab, September 22, 2014.) Contrary to the public’s impression, very little definitive scholarly research shows that transit reduces congestion. It is impossible to manage an organization that does not have a clear objective(s). This is a conversation we need to have. What do we want Metro to do? Is it to reduce congestion? Provide transportation to those who cannot afford a car or are physically incapable of operating one? Spur redevelopment? Perhaps Metro should have another referendum to answer this fundamental question. And then the question we will have to ask ourselves: What is the most cost-effective strategy to accomplish the objective(s)? There is no way to know that answer, until we know the objective. But I doubt light rail, especially at-grade light rail, is going to be the solution for any objective. In the meantime think about this. What could we have done instead with the $2.2 billion that was spent on light rail? The answer is lots. Like solving most of our flooding problem or resurfacing virtually every street in the street in the City or repairing our dilapidated wastewater system or putting more police officers on the streets or demolishing some of the thousands of dangerous buildings in the City or any one of dozens of other critical priorities facing the City. [i] Metro keeps separate ridership statistics on its local service, which covers the city street grid, and its “Park & Ride” service, which shuttles passengers from the suburbs using its HOV system. [ii] The FTA counts “unlinked” trips. That is anytime a transit rider get on a transit vehicle. Because riders frequently must transfer between buses and/or trains, a single commute can result in a transit agency (including Metro) counting a single commute two or more times. 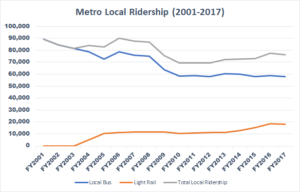 Some Metro critics argue that Metro’s ridership statistics are inflated because the light rail system resulted in more transfers as riders were forced to take a bus to an LRT terminus to continue their trip. I have not found any data that would support or refute this claim. Metro can track transfers on riders which use the Metrocard, but it has only aggregated that data for one short term study fairly recently. I cannot think of any way to reconstruct the data going back to 2003. [iii] At least, that is what pretty clearly happened when the original red line on Main Street was opened 2004-2005. It also appears to have occurred when the Main Street line was extended to the north in 2013. However, there was an increase in ridership when the East End and University lines were opened in 2015, without any corresponding decrease in bus ridership. This was about the same time that Metro rolled out its Reimagine program, which dramatically restructured its bus routes. So, it is difficult to sort out whether the new light rail lines had fundamentally different ridership dynamics or if there was a loss in ridership along those lines like the Main Street line that was offset by an increase in ridership from Reimagine. …and what kind of metropolitan rail transportation system doesn’t serve EITHER of Houston’s airports?? I read that the accident rate in Houston is higher than anywhere else in the country???? Perhaps most significantly, the presence of the light rail system helps with air pollution. Rail usage doesn’t pollute our air like driving does. Houston is not the USA’s most polluted city. Would that be the case without light rail, in the wake of so much population growth and vibrant refinery and shipyard activity? It’s debatable. Pollution has all sorts of adverse impacts on our lungs, brains, and hearts (etc.). It even leads to birth defects. Who needs ’em? 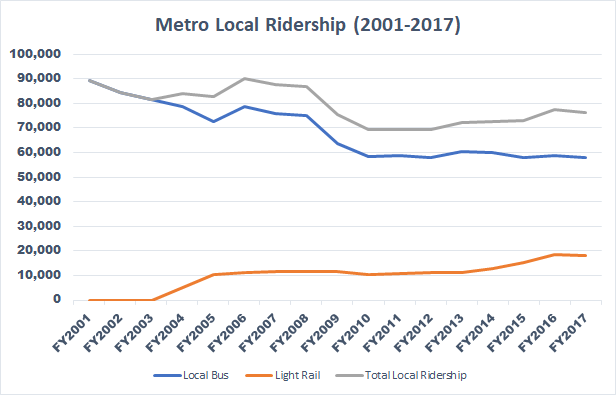 Nevertheless, why has Metro ridership (supposedly) declined since 2001? Here’s a theory: Perhaps Metro has reduced traffic congestion enough to enable more folks to move out to the suburbs while still working in Houston or at least Harris County. Since Houston Metro does not yet connect with such locales (including, for example, anywhere near the Berry Center in Cypress), such folks have had to continue driving to work each day. However, previously it wasn’t feasible to do so, due to traffic. As a result, fewer folks lived in the suburbs around Houston and more lived in the inner core. The more recent dispersing of people across a larger geographic area nowadays (arguably made possible by Metro) has seemingly resulted in less of a strain on water, sewer and drainage systems throughout the region. Admittedly increased use of pavement purportedly impacted Harvey flooding though. Nevertheless, enabling more folks to spread out as they have done seemingly decreasingly taxes our resources. Having said that, how ’bout some Metro voucher-financed, app-enabled, route-adapting electric taxi buses like what Via and Chariot make possible? Metro gets around 90% of its service paid for by taxpayers (not riders). Wouldn’t the abovementioned scenario be a more beneficial way to spend all those tax dollars? Rich, a study was done of the air quality benefits of light rail and they are negligible. The only potential benefit comes from using electricity instead of the bus burning diesel. But all of Metro’s buses are clean diesels with minimal emissions, so the difference is barely measurable. And remember, the light makes up less than .1% of the daily trips in the Houston region. Most of the improvement we have made on air quality came from EPA and TECQ programs to retire older diesel engines in the region that high NOX and VOC emissions. Admittedly it’s hard not to wonder about Metrobuses’ emissions, considering how it smells rather foul near their exhaust pipes. One fears carbon monoxide intake too, but admittedly I’m no chemist or mechanical engineer. Metro rail would be great if it went places people wanted to go. I ride occasionally. Don’t see a lot of people paying for tickets or any ticket Takers on the trains.